Bobby Johnstone, who died in Selkirk on 22nd. August 2001 aged 71, will be fondly remembered as Athletic’s biggest-ever crowd-puller and best-loved entertainer. He was the master-craftsman of his trade: clever on the ball, a supreme footballing artist, a talented exponent of the weighted pass and a player who, with one sway of the hips, would often leave defenders literally going the wrong way. Bernard Halford was assistant secretary in those magical days of the early 1960's and recalled, "He transformed the club, no doubt about that. He had the crowds flocking down Sheepfoot Lane, even though Athletic were in the Fourth Division. I think it was the only period in my life when I regularly told lies. On match days the phone never stopped ringing. ‘Is Johnstone playing?’ Bobby might have been sitting in my office with his ankle in plaster, but I had to say he was playing, otherwise the fans wouldn’t have turned up. It really was as cut and dried as that." After a memorable career with Hibs (twice) and Manchester City, with whom he made history in 1955 and 1956 by becoming the first player to score in successive FA Cup finals, Johnstone was brought to Oldham by Jack Rowley in the autumn of 1960. The club’s average crowd was 4,000, but when Johnstone lined up for his debut on October 15 of that memorable year there was an official attendance of 17,116. The Johnstone era was under way. 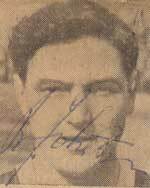 Bobby made a scoring debut in a 5-2 win and immediately earned himself a place in the hearts and minds of Athletic fans, who were crying out for success after many lean years. Nearly 42,000 crammed into Boundary Park in January, 1962 when a Johnstone-inspired Athletic gave mighty Liverpool the fright of their lives before going down 2-1 in the FA Cup. Halford takes up the story. "In the promotion season of 1962/63, we scored 95 league goals and half of them were scored by Bert Lister (30) and Colin Whitaker (17). Most of them were created by Bobby." Halford continues, "He missed one penalty in the whole of his career ­ against Exeter at Boundary Park when the ‘keeper moved early ­ and he was so accurate that he could pop them in off a post. I recall that when Les McDowall became manager there was a period when he kept Bobby out of the team. It struggled badly without him and in the end the manager was forced to bring him back. Restored to the team, and with a point to prove, he turned on one of the finest exhibitions of individual skill I’ve ever seen. It was real ‘bag of tricks’ stuff and the crowd loved it. Athletic won 2-0 and as the teams left the field, one fan went up to Les and shouted, ‘ Now you know why 10,000 of us were right ... and you were wrong!’ Eventually, Les brought young Jim Bowie down from Scotland to replace the maestro. 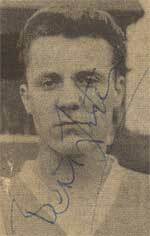 Jim was a talented young player who went on to do a good job for Athletic. But one day Les was heard to ask Bobby what he thought of the youngster. 'He’s a good lad,' came the reply, ... but at his age I had been capped eight times by Scotland! It tended to put things in perspective and that was not being disrespectful to Jim. Few players were on the same plane as Bobby. He was a fantastic player, who provided me and many thousands of Oldham football followers with the sort of memories they will cherish forever." Jimmy Frizzell, a team-mate who went on to become manager of the club, spoke for all Bobby’s playing colleagues at Boundary Park when he asked of his fellow Scot, "What on earth would he have been worth in today’s football market place? He had great ability, he was a tremendous reader of the game, he had an astute footballing brain and he had superb touch. His best days were at Hibs, but Latics fans will take a lot of convincing." After finishing his football career, Johnstone turned his hand to other sports. He played cricket for Hollinwood and became an accomplished crown green bowler, representing Hollinwood Institute and Springbank. Stan Boston, friend and pairs partner at bowls, said, "He was a very good ‘skip’ and we won the Lancashire over-55s pairs together." Bobby Johnstone - Footballing Legend and a new beginning for Oldham Athletic needs to be remembered as the best loved entertainer that Boundary Park has ever seen. The LSC believe that an everlasting tribute to Bobby should be installed at Boundary Park, whether it be some kind of statue or even naming a stand after him. Something needs to be done for Oldham Athletics footballing saviour. What did Bobby achieve as a player? Part of the Famous Five - Johnstone, Gordon Smith, Lawrie Reilly, Eddie Turnbull and Willie Ormond all played in the forward line together and all became Scottish Internationals who all scored over 100 goals for Hibs. David Cain: I and my brother watched most of Bobby’s games for Latics. I remember travelling to Wrexham on a very wet and windy day in the early 60s. The match should have been postponed as the pitch was a mudheap and rain came down for all the 90 minutes. Bobby scored a goal which has lived in my memory forever. A Latics attack broke down with the Wrexham keeper collecting the ball. He cleared the ball upfield to the centre circle were Bobby was stood, just in his own half. As the ball reached Bobby he volleyed it back over the keepers head and into the net. I can still see the look of astonishment on his face as the ball sailed past him. When the ball hit the back of the net it had not touched the ground from leaving the keepers boot. This was in the days of the leather ball which was always a little heavier as it held some water when raining. 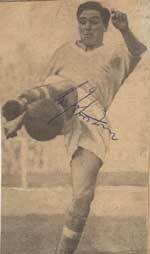 I believe Latics should place a statue of Bobby in front of the new stand with him juggling the ball on his right foot as this was his style. Peter Fletcher: I can remember that first match against Exeter. My brother took me to my first pro football match and I was amazed when this short,slightly overweight guy came on and my impression was, and I was only 12, that this player could not be the star attraction.How wrong I was ! Bobby was so exciting to watch and I never missed a match in which he played. I thought I was wrong to think I only ever saw him miss one penalty but Bernard Halford reassured me in his comments that I was right.I can always picture him clipping the post as the ball went in. Some years later I read in a magazine Di Stefanos world 11 and Johnstone was one of the names he had chosen.I wish to this day I had ripped out the page. I would like to see Bobby remembered with an annual charity match (say pre-season) in his name against a team that he used to play for say City or Hibs or if that was not possible a specially chosen tune that depicts his style of play, flair, entertainment. A signature tune that would be played before each match to let the players remember that you can play football and be entertaining as well. Adrian: Great idea to have a Bobby tribute. I'm too young to have seen him play but the mention of his name makes my dad go all misty eyed. I think Oldham Athletic should have a statue out side the new entrance to Boundary Park in a typical Bobby pose, say after he had scored, or arms aloft in a statement of triumph. It could inspire all who see it. I bet if it wasnt for him and Lister we would all be Man U. fans. I shudder at the thought. Richard (German Blues): Unfortunately, I think in these commercial days renaming a stand may only turn out to be a temporary tribute. I would prefer something that will be around as long as the club. (maybe I shouldn't say that!). I think I prefer the idea of a statue but I realise this could be expensive. How about starting the fund anyway, see how much is raised and then voting on a choice of three or four affordable possibilities. Maybe a decent local artist could paint his portrait on one of the exposed walls? If the worst happened and not enough was raised for something of this nature, a Bobby Johnstone cup of some description could be purchased and presented to a player voted for by the fans each year for a particular category. Let me know if anything kicks off, I would happily contribute to a deserving tribute for a man so important to the club. Mike: Just a quick e-mail to tell you that I am currently making a Bobby Johnstone Tribute Website. I'm hoping to have it all finished and put up on the web by Tuesday. I'll let you know the web address and everything. I'm all in favour of doing something in Bobby's name. Suggestions of renaming the Rochdale Road end won't be possible, as it's now the ITV Stand. If the Lookers stand is rebuilt, then maybe then that could be called the Bobby Johnstone stand. Desperate Dan: I think it's a great idea. Johnstone was unique in Oldham's history and should be remembered in a special way. Don't know how though. Luke Summers: I have today emailed Sean Jarvis Latics Marketing manager for his thoughts on renaming the Rochdale Road Stand the Bobby Johnstone Stand. Any ideas from any other Latics fans. Jimmy Riddle: How about finding out if the club would consider renaming a stand although they would want money as sponsors always chuck in lots of bread for the priviledge. Carol Smith : When the Ford Stand is revamped they could name it after him.